This single-pin configuration has its merits, and one of them is that you can adjust the shooting distance up to 100 yards. 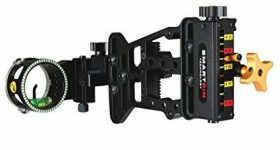 There are no micro click adjustments, and the knobs for adjusting windage, elevation, and yardage move smoothly and without the need for an extra tool. It comes with the React technology that improves accuracy and allows you to challenge targets located at far distances. The faulty instructions seemed to have caused a bit of grievance among the users who say that they needed to find extra information to understand how to mount the bow sight on their setup. – You must bear in mind that this is a single-pin bow sight and it has its ups and downs for this reason. If you have only used multiple-pin models so far, and you want to try a model with just one pin, you will make a good choice if you pick this one. As expected from a company of this caliber, its one-pin models are on par with the ones that use multiple pins, regarding accuracy, as well as other advantages. You can adjust this model to shoot at distances varying between 20 and 100 yards, so you will be able to expand your range in the most convenient manner possible. – Adjustments are easy to make and among the advantages that make this particular bow sight such an excellent option for most bowhunters. You will notice that this model doesn’t work with micro-click adjustments, so, if you are among those people who like to engage in 3D shooting competitions, you will find this aspect a drawback. 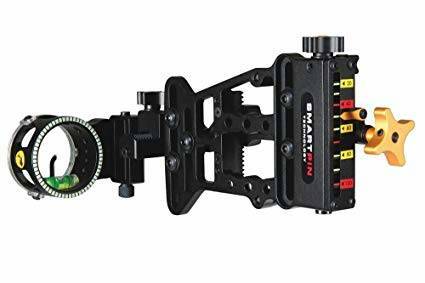 However, if you prefer making your adjustments on the go, without the need for any tool, you will discover that customizing elements such as windage, elevation, and yardage, with the use of the available knobs, is a real breeze. For those who like having plenty of freedom when they are out in the field, this particular feature can be seen as an advantage. Also, it must be mentioned that this model caters to both right-handed and left-handed users, which is another great plus. – Taking a look at the overall construction of this bow sight will tell you a few things. For instance, the fact that the body is made from aluminum is an upside because it means that the model will resist some wear and tear without a glitch. Also, you can drag it along with you through all weather conditions, because the aluminum body will not catch corrosion or rust. However, there is something you need to bear in mind here, and that is the simple fact that it is a bit on the heavy side, as it weighs around ten ounces. For anyone who wants to keep a compound bow setup lightweight, such a bow sight might not be the most indicated option. – You may appreciate the fact that this model comes with a rheostat light and that the pin is also visible, to grant you that advantage you most probably want when you are out in the field, and the light conditions are less than ideal. However, you should remember to check the legislation in the state where you’re going to hunt, as some may not approve of such an accessory. If that is the case, you can ask the Trophy Ridge customer service to remove the light for you. When it comes to pitting the one-pin configurations against multiple-pin configurations, there is quite a passionate debate going on. What we want to say is that, if you intend to try a single-pin model for the first time, the Trophy Ridge React-One is the one you should try. Offering you the possibility to challenge yourself by trying to shoot arrows at distances of up to 100 yards, it might be just the thing that can help you hone your skills as a bowhunter. While the overall construction and operating features highly recommend this model, it is a bit heavy, so it might not be the right pick for someone who wants to travel light and use a setup that will not become burdened with extra accessories.